Ford 302 FOX conversion kit. This kit is intended for customers requiring all parts to convert some crate engines to 1979-1993 spec Mustang or other Fox chassis vehicle. It is also ideal for customers building a complete new engine. 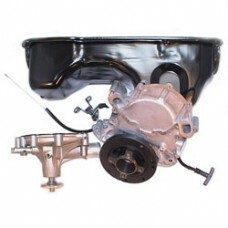 This kit includes dual sump oil pan, oil pump pickup tube, crank damper (50 oz.-in. with 4-bolt), timing pointer, reverse rotation serpentine water pump and aluminium front cover. Kit does not include low oil sender. Application: Late model Ford 302 – must have rear dipstick location in block.